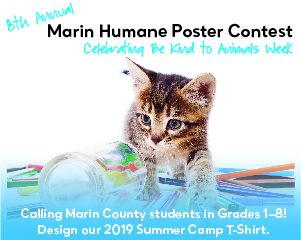 When school is out, our Humane Summer Camp is in session! If your session of choice is sold out, you can add your name to the wait list. TCA’s who have submitted an application will be notified of acceptance by April 13. If you are experiencing difficulties with this process or have questions, please call 415-506-6288. Animal-themed arts, crafts, games, and daily visits from Animal Ambassadors. An introduction to basic animal care plus animal-themed arts, crafts, games, an opportunity to learn and practice the basics of dog training, and daily visits from Animal Ambassadors. An introduction to advanced animal care plus animal-themed arts, crafts, games, daily visits from Animal Ambassadors, and an opportunity to learn and practice the basics of dog training. 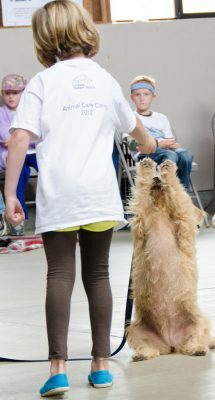 Teens will experience the daily work of an animal shelter. They will learn about animal related careers, animal care and behavior, and animal welfare. Daily hands-on experience with shelter and volunteers’ animals. Scholarships are available for low-income families. The date of your contact will be considered for placement because the camp registration is on a first-come, first-served basis for 2019. Teen Camp Assistants (TCAs) volunteer to guide campers in crafts and games, and act as mentors for the session. TCAs will be chosen through an application. Teens apply without payment and are notified of their acceptance in late March. 100% of camp fees, less a $35 administration fee per camper, will be refunded if requested more than three weeks prior to the start of camp season, before May 27, 2019. No refund (0%) of camp fees will be made within three weeks (21 days or less) prior to the start of the camp season, after May 27, 2019. No partial refund will be made for missed days. 171 Bel Marin Keys Blvd. We rely on the generosity of animal lovers to do our work and are not a chapter or affiliate of The Humane Society of the United States or the ASPCA. Our Tax ID (EIN) is 94-1156562.